In the occasion of the 25th Anniversary of the Gala Italia a Gold Medal was awarded to the best wine of each Italian producer participating in the Gala Italia. 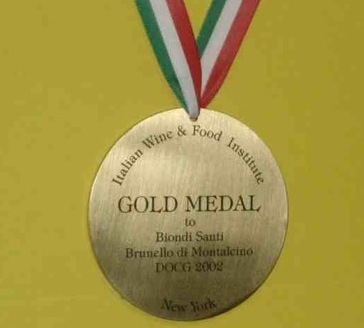 The medal was made for the occasion by the Italian goldsmith Vezzaro in Vicenza and is engraved, on the front, with the logo of the Gala Italia and, on the backside, with the name of the wine producer, the denomination and the vintage year of the award winning wine. The medal was assigned by a jury of independent American wine specialists whose names were deposited with a notary and kept secret. The jury, whom we thank, was composed of: Richard Braun, Sirio Maccioni, Tony May, Peter Morrel, Berardo Paradiso and Piero Selvaggio.